Gov. 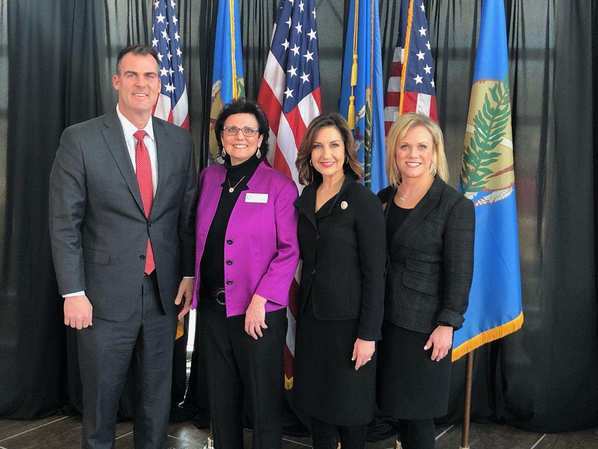 Kevin Stitt, Oklahoma Teacher of the Year Donna Gradel, State Superintendent of Public Instruction Joy Hofmeister and Broken Arrow Public Schools Superintendent Janet Dunlop gather for the announcement that Gradel has been named a National Teacher of the Year Finalist. BROKEN ARROW (Jan. 23, 2019) — Oklahoma’s 2018 Teacher of the Year is a step closer to claiming the profession’s highest honor. In a news conference this morning at Broken Arrow High School, Gov. 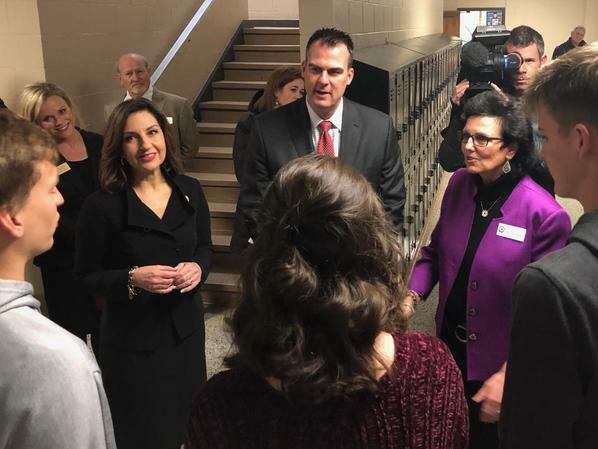 Kevin Stitt and State Superintendent of Public Instruction Joy Hofmeister announced that Donna Gradel of Broken Arrow High School has been named one of four finalists for the National Teacher of the Year award. “Donna’s teaching philosophy is that every student has potential no matter his or her start. Her heart captures perfectly the power of education itself – to see the best in a student and to cultivate that potential so the student can overcome all odds and become a job creator, a future U.S. president or city mayor, a community leader, a professional educator or a scientist,” Stitt said during the announcement. An environmental science teacher, Gradel is known for challenging her students to find solutions to real-world problems. She and her students created the Aqua for Tharaka campaign, which provided clean water and protein for impoverished orphans in a remote region of Kenya. Gradel’s students designed aquaponic systems for the project, and after months of research and data collection, teacher and students traveled to Africa to complete the system. State Superintendent of Public Instruction Joy Hofmeister, Gov. Kevin Stitt and Oklahoma Teacher of the Year Donna Gradel talk to students at Broken Arrow High School. Moreover, Gradel’s students have undertaken local projects, including a sweeping analysis of air quality, light quality and energy consumption at Broken Arrow High School. Another initiative, “Together Project,” is a collaboration between the city of Broken Arrow and Broken Arrow Public Schools to find environmentally friendly ways to restore and enhance the city’s waterways. During the project’s first phase, her students designed a floating wetland to improve water quality on a local retention pond. Gradel, who began her career as a special education teacher in the Appalachian Mountains, will travel to Washington, D.C., in February, where she and finalists from Alaska, the District of Columbia and Virginia will be interviewed by a national selection committee to determine the National Teacher of the Year. The award will be announced this spring. It has been more than 50 years since an Oklahoma educator received the national honor. Past Oklahoma recipients include Edna Donley of Alva High School (1959) and Lawana Trout of Charles Page High School in Sand Springs (1964).